In stylistic terms, Soviet comedies of the 1960s firmly belong to the international tradition that appeared in the wake of Truffaut’s Tirez sur le pianiste (1960) and other French New Wave films, which consciously appropriated features of early silent cinema. New Wave films have never exclusively dealt with comic topics, but in large part it was their playfulness and the introduction of their new stylistic devices in popular comedies that made them successful. A light touch, foregrounded reflexivity, episodic structure and cartoonish characters became the hallmark of mainstream popular European cinema in the 60s. These innovations were very quickly and successfully taken up in Eastern Europe. Their appearance coincided with a gradual loosening of control over the arts that had already begun with the Thaw before the emergence of the New Wave. Under these conditions, filmmakers in Eastern Europe found such stylistic innovations useful in trying to combine the irreverent nature of satire with lightheartedness, which appealed to wider audiences. Thus, perhaps even more than in the West, popular comedy opened a possibility for filmmakers to engage in debate about important social matters. 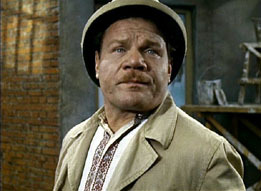 Leonid Gaidai earned the title of the most prominent Soviet film comedy director in the decades that followed the release of his sixth feature, Operation Y and Other Shurik’s Adventures [sic] (Operatsiya Y i drugie priklyuchenia Shurika) (1965). In 1955 he graduated from VGIK, in the master class of Grigoriy Alexandrov, Eisenstein’s collaborator and a well-known Soviet director of film comedies. Probably because of his formative years at VGIK and the influence exerted by Alexandrov, American silent comedians – Chaplin and above all Keaton – directly inspired Gaidai. This is apparent in many of his movies. Another of his early films, Kidnapping Caucasian Style, or Shurik’s New Adventures (Kavkaskaya plenitsa ili novye priklyuchenia Shurika) (1966) plays like a mélange of situations and objects appropriated directly from Keaton’s silents: the kidnapping and the car from Sherlock, Jr (Buster Keaton, 1923) the escape from the hospital and ambulance ride from Cops (Buster Keaton and Eddie Cline, 1922), the river sequence that seems to have come directly from Our Hospitality (Buster Keaton and John G. Blystone, 1923) and Shurik’s capture of a bear replicating an event from Hard Luck (Buster Keaton and Eddie Cline, 1921) (Keaton’s favourite short). Gaidai loved slapstick, and as his collaborators bear witness, the action could never move fast enough for his taste. His comic technique also often depended on associative reasoning. For example, the beginning of Kidnapping Caucasian Style features a couple of Keatonesque gags in which Shurik’s attempts to motivate his donkey are compared with the driver’s attempts to start the truck, while the light footsteps of the heroine are intercut with the front legs of a trotting donkey. One of the most important formal patterns enabling the creation of associational conceptional networks in silent comedy is the sight gag. Noel Carroll defines it as a “form of visual humour in which amusement is generated by the play of alternative interpretations projected by the image or image series.” (1) Given that research in experimental psychology has supported the hypothesis that human beings understand the world by constructing working models of it in their minds, we might say that the alternative interpretations invoked by a sight gag can be more precisely described as mental models constructed by the viewer. Some of the mental models used by the mind are highly artificial, while others are acquired without special instruction. When applied to human understanding of narratives, this implies that “readers understand narratives by creating a situation-model, which represents the narrative world described by the text rather than the text itself.” (2) In other words, situation models in the reader’s mind are distanced from and relate to reality, in a similar way to how they operate regarding textuality, which serves as the basis of a particular diegetic situation model. Thus, the alternative interpretations proposed by a sight gag are nothing other than alternative working models, which mimic and explain the relations and behaviour of objects present in the diegetic space. While the instances of visual humour that will be described in this article, and their relation to the narrative of Operation Y and Other Shurik’s Adventures, do not clearly belong to the category of the sight gag as defined by Carroll, one of our aims here is to argue that they function on basically the same principles as does the sight gag proper. However, we are less interested in proposing an alternative typology of visual humour than in explaining how the potential for associative reasoning pertinent to film comedies, and specifically to the sight gag, can work towards the creation of complex, reflexive working models of the world outside the diegesis. Comic events that we will provisionally call sight gags function in Operation Y and Other Shurik’s Adventures much as they do in Keaton’s or Tati’s films: they are the pivotal points of individual comic situations. Initially and individually, sight gags bring about and rely upon the formation of ancillary, temporary situation models, and Gaidai was not above making a joke whenever he could. On the other hand, since the silent days, filmmakers have occasionally developed the principles of the sight gag more systematically, sustaining alternative situation models over a longer period. By looking at several of Gaidai’s films that in various ways establish satirical situation models, we can see how those develop from the basic diegetic situation models from which they depart. These models appear as explanations of strings of incidents that support the formation and existence of parallel working models. The alternative, mutually exclusive working models suggested by individual events (sight gags) play a crucial role in the formation of the much more abstract explanatory models that can be seen as actually proposed in this movie, and which in return articulate and emphasise the division between the diegetic level, and satiric level of specific individual events. These reinterpretations all spring from the reinterpretation of individual objects, during the process of spinning-out of alternate ways of conceptualising the formally closely-related signifiers. Only one such reinterpretation is sometimes sufficient to quickly initiate reinterpretation of a whole network of related objects-events. Thus, although the “sight gags” in Operation Y and Other Shurik’s Adventures may appear simple when looked at individually, and when compared to the sight gags of the classical era, understanding that the director’s intervention implies a dense conceptual background helps the viewer appreciate the complexity of the interplay between diegetic objects, their arrangements, and their incorporation into alternative working models. These models are built gradually as the film’s plot develops. Gaidai never lets them lapse from the viewer’s focus; he carefully arranges diegetic events so that alternative mental models have appropriate elements available, and as a result can change and develop during the viewing of the movie. The use of slapstick lends the whole exercise more perspicuity: the simplicity of the diegetic plot line weakens the competitive diegetic situation model in comparison with the alternative, “allegorical” meaning to the point that the latter becomes more plausible and relevant. But it is more important to notice that because of the closely connected signifying processes, the diegetic situation model becomes a sine qua non of the satirical meaning, not only initially, and occasionally, but persistently, and with strong rhetorical force. This is why it will be necessary to describe in more detail the events, which take place in two out of three episodes of Operation Y and Other Shurik’s Adventures. However, it is Gaidai’s films from the ’70s that most clearly display reflexive structures in which the doubling that we have indicated as pertinent to sight gags is applied throughout the plot so persistently that it assumes the features of mannerism. Whilst taking a brief look at Ivan Vasilievich Changes Profession (Ivan Vasilievich menyaet professiyu) (1973) will help explain the way in which the viewer creates a reflexive reading position, our ultimate objective is to describe the reflexive potential of Operation Y and Other Shurik’s Adventures, which was made in the very specific historical conditions of failed economic reforms in the Soviet Union. In Gaidai’s Ivan Vasilievich Changes Profession we find a clear example of a sustained effort to create a logical space for the interplay of mutually exclusive situation models by application of corresponding principles at the level of the whole plot. The movie was inspired by Bulgakov’s play Ivan Vasilievich, adapted by Gaidai to a contemporary setting: Shurik works on the time-machine that can take him back to the past, and manages (in his dream) to bring Russian Tsar Ivan the Terrible to one of the Soviet Union’s apartment buildings, while sending a thief and a would-be-apparatchik together back to medieval Russia. The main actor Yuri Yakovlev plays two roles, Tsar Ivan Vasilievich (Ivan the Terrible), and Soviet citizen Ivan Vasilievich, a not-so-intelligent “upravdom,” a semi-official bureaucrat who in Soviet times took care of the communal life in high-rise apartment buildings (3). Exchanging the contexts of these two figures allows Gaidai to compare two very different settings, the paranoid, imperial court of Ivan the Terrible, and the seemingly safe but boring everyday life of the Soviet Union in the early ’70s. While Ivan Vasilievich brings contemporary Soviet attitudes to 16th century Russia, Ivan the Terrible causes havoc in the smoothly-run but repressive Soviet regime. Even the opening credits of the film reveal the doubling to ensue: written in a contemporary Russian alphabet, in the middle of the screen the characters switch into an old Russian Cyrillic font. George Myloslavskiy, the thief who gets involved in the whole plot while trying to rob Shurik’s neighbour, a dentist, is sent back to the old times together with “upravdom” Ivan Vasilievich. He is a con artist who can change his identity with ease, reinforcing the film’s tendency to offer a doubling situation model to the viewer. At the beginning of the movie he changes his voice while making a telephone call to a sweet, seducing female voice in order to find out when the dentist would not be at his home. Later, he changes jackets and glasses, assuming any role that can help him survive (4). Nevertheless, even he struggles to master the violent, paranoid world of the Russian court. While the whole film combines Bulgakov with inevitable slapstick, as Gaidai again finds the time and place for police chases reminiscent of the Keystone cops, the construction of competing situation models remains the main structural principle of the film (5). By mixing present with past, and by using a number of obviously identical bodies in two entirely different set-ups, the director persistently forces viewers to consider the extent to which the meaning of a particular physical and psychological entity depends on the link with other contemporary objects. Simultaneously, he provides an opportunity for viewers to reconsider their propensity to automatically approach objects with a certain prejudice, arising from knowledge based on already arranged elements of the story. In addition to the reflexive structure, which arises out of this conflict, the film obviously refers to Eisenstein’s classic Ivan the Terrible, further complicating an already complex associational structure. Even the credits mentioned above may be seen as referring to the credits of Part I and Part II of Eisenstein’s movie, respectively (6). It is with these insights in mind that we turn to Gaidai’s earlier film Operation Y and Other Shurik’s Adventures, a seemingly innocuous slapstick omnibus comprising three episodes, which describe the life of the Soviet student Shurik in the mid-’60s. It will provide us with an example of a complex, potentially reflexive relationship between a diegetic situation model and the world-view (or we could say, working model of reality) held by the viewer. The film was produced by Mosfilm, and was a blockbuster in the Soviet Union upon its release in 1965, with 70 million viewers. It is one of the key films in Gaidai’s oeuvre, and very important in recent critical reevaluation of him as one of the most popular post-war Soviet (Russian) directors (7). The film has certainly survived its time; Yeltsin’s authorities used it as a “filler” on television during the counting of votes in the presidential election of 1996. According to Sergeii Dobrotvorskii, “Gaidai’s films proved to be the most effective collective antidepressant without any side effects.” (8) However, here we are primarily interested in the impact the film might have had on viewers when it appeared in cinemas for the first time. After Stalin’s death and Khrushchev’s speech in 1956, a period of instability ensued, with gradual relaxation of the very strict control, first over the cultural, and later over the political life of the Soviet bloc countries. As mentioned, Eastern European cinemas were able to address socially relevant questions during this period, in which the need for wide-ranging political and economic reforms was high on the social agenda. The Thaw, as these changes were named, proceeded at an uneven pace, with periods of liberalisation followed by a renewed tightening of Party control over social life. The former periods were generally inspired by the recognised need to catch up with the West in economic efficiency as well as make up for the political deficiencies of “people’s democracies”. The latter followed in the wake of larger political crises when it appeared that the reforms might have gone too far in diluting the power of the party to control events (for example the uprising in Hungary in 1956 and Prague Spring of 1968). This period of sporadic attempts at reform, which brought the reformulation of tenets of Socialist Realism in art and a significant increase in the production of consumer goods, as well as the opening of space for limited private initiative in the economy, lasted around 15 years, from 1953 to 1968. It covered the initial power vacuum immediately after Stalin’s death, the reign of Khrushchev, and the first few years of Brezhnev’s leadership. In this period the party ascribed an increasingly important role to artists and intellectuals who were ostensibly at the forefront of the search for new solutions for social problems. As already mentioned, the second half of this period coincided with the appearance of the New Wave, which appealed to many filmmakers across Europe. This is the broad historical framework in which Gaidai made his omnibus film. Let us see in detail how Operation Y and Other Shurik’s Adventures refers to events in the economic and political sphere, how it constructs an alternative situation model, and finally, how it offers a sharp-witted point of view on complex social events (9). The first episode of Operation Y, “Naparnik” (“Partner” or “Co-Worker”) tells the story of a petty criminal sent for a day of corrective labour to the building company where Shurik works as an intern. A prior encounter and argument with Shurik on the bus no. 13 was the initial cause for the unruly, burly drunk, a counterpart of the slapstick comedy villain, being sent to jail. Before he and Shurik meet again, we see him among other wacky, slothful inmates, one of whom has his shirt wide open, revealing a drawing of Sputnik 1 tattooed on his chest with the caption “I want to go to the moon.” The reunion of the bespectacled Shurik and the ruffian escalates into a conflict, which provides a rationale for the wild chase throughout the building site in which building equipment and various materials are used as weapons in their personal war. If at the beginning the cause of their hostility was uncivil behavior, at the end the war erupts because of the lout’s laziness. Shurik’s partner refuses to work and lies down wherever he sees a suitable spot. Although Shurik is in charge, he cannot fire his co-worker or change his behaviour, and the work suffers accordingly. Obviously, the behavior of Shurik’s “naparnik” stands for those significant numbers who behaved according to the well known motto of the socialist labor force, “you cannot pay me as little as little I can work.” At first sight, the film seems to advocate more, rather than less strict societal control, as part of a solution to the problem, but that is not as important as the fact that it successfully locates weak spots in the national economy. Thus, “Co-Worker” deals only on the superficial, diegetic level with delinquent behavior, while asking the crucial question, what is the future of a system unable to motivate its working force? The brute even spells it out to Shurik: “You work for rubles, and for me this is enforced labor”. In an earlier scene we see him pass by the “doska pocheta” – the best workers achievement billboard – which obviously does not impress him very much. Therefore, the question of economic motivation, the crucial problem of the centrally planned Soviet economy, provides a key for building a comprehensive alternative “situation” model and interpretation of the first episode. In addition to the initial diegetic situation model, a Soviet viewer of the time can easily build an extended, and alternative working model, which is in fact too abstract to be called a situation model. They are both simultaneously applied to the “same” objects, which acquire different importance and meaning according to the mental model in which they are included. Filmmakers who in any way wish to refer to reality outside the diegetic world face the question how individual incidents can be related to the wider conceptual field, which is necessarily organised with the help of working models. This abstract conceptual field suggested in “Naparnik” clearly conveys a message about the economic and political situation in the Soviet Union of the time. Considering that Operation Y and Other Shurik’s Adventures were released in July of 1965, the viewer could assume that its first episode advocates economic changes along the lines of those proposed by the Kharkov economist, Professor Evsei Liberman. Three years earlier, in September of 1962, he called for a broad debate about profit-earning capacity and profits in the Soviet economy, and in the next few months the Communist Party unwillingly began to debate inevitable reforms. Khrushchev, whose ideas about economic reform always relied more on party activism and command methods than on market mechanisms, proposed strengthening the role of the Party to counterbalance the economic independence of enterprises. However, the whole effort was shelved in November of 1962. In the summer of 1964, several months before his fall, Khrushchev, facing increased economic problems, again brought Liberman’s ideas into public view. This time some initial experimental reforms were implemented, and late 1964 and 1965 were the most favourable post-war years for the limited economic reform in the Soviet Union before Gorbachev came to power. A Leninist party is the enemy of subjectivism and drift in communist construction. Harebrained scheming; premature conclusions; hasty decisions and actions divorced from reality; bragging and bluster; a penchant for management by fiat; an unwillingness to take into account the conclusions of science and practical experience; these are alien to the party (10). Faced with these questions, we realise that the third character in “Co-Worker” provides a much less ambivalent key to the interpretation of the episode. For the main engineer at the construction site is a highly overdetermined incarnation of this description of Khrushchev (neither here nor in the Pravda article mentioned by name) (11). For example, he is wholly oblivious to the total lack of discipline at the place he runs, and he strolls among the unfinished walls of the housing estate incessantly spouting official ideology. To begin with, he compares contemporary production statistics with those of the year 1913, the last peaceful year before the war, which brought the Revolution (12). Later, he brags about scientific successes, “our spaceships which cruise the cosmos”, about surpassing America, and about grandiose schemes for housing projects. In the meantime, the drunk licks his ice-cream, wipes his hands on the main engineer’s clothes and spends his time “at work” eating and sleeping. 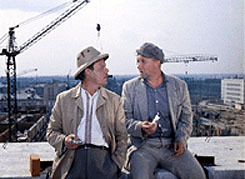 Also, the building site setting of “Co-Worker” has strong links to Khrushchev. He was well known to the domestic audience as the man behind the mass construction of housing in the early 50s, when he initiated the building of a huge number of ugly prefabricated buildings with small flats in order to solve the housing problem in Moscow. The public even nicknamed them “khrushcheby” (from “trushcheby” – slums). As if this were not enough, references to Khrushchev’s animosity to religion, as well as to his extensive trips abroad are included. 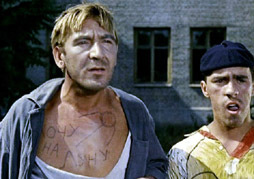 Once we realise that the main engineer wears the same Ukrainian shirt that Khrushchev very often wore in public (also sported by one of the briefly glimpsed jailed hoods at the beginning of the episode), it becomes clear that “Co-Worker” was above all a not-so-gentle farewell to Khrushchev in the most popular Soviet film of 1965. It seems obvious that in “Co-Worker” the construction of an alternative, or extended satiric working model by the viewer proceeds via a series of connected sight gags as defined by Carroll. One situation model controls the meaning of the diegetic characters and events, such as the conflict on the public bus, the relationship between Shurik and the hooligan etc. The alternative, satiric model, which is based on the former, builds a much more abstract network that relates to Khrushchev, to the various social groups, and complex developments in the Soviet society. Every time that the viewer perceives elements which lead him/her to apply the alternative working model to an object-event, a cognitive event comparable to the sight gag takes place. Like in a sight gag, a small detail can shift the viewer’s interpretation in the desired direction. The major difference may be found in the degree of surprise: an isolated sight gag that elicits an alternative mental model often causes more astonishment than a corresponding figure which is interpreted according to an already established explanatory pattern. But this need not be the case, as we can see in Operation ‘Y’ and Other Shurik’s Adventures, in which the fast pace of slapstick keeps the viewer continually occupied in constructing a diegetic model from events that develop with breakneck speed. Under these conditions, the uneven pace of the development of a further, abstract working model, which refers to the political questions of the Soviet Union, causes the viewer to repeatedly react with significant surprise, especially as the cues that activate the abstract model already possess a comic potential stemming from their function within the diegetic context. 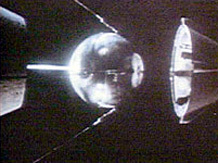 The reference to Khrushchev is not made only through the character of the main engineer (one of the louts has already staked his claim to the Moon); but he is a final trigger helping to establish a firm and consistent abstract working model, which is then reapplied to the preceding incidents of the episode. Shurik’s second adventure in “Strange Impression” (“Navazhdenie”) portrays the love life of the young generation and is again inspired by early Keaton, especially The Scarecrow (Buster Keaton and Eddie Cline, 1920). This serves as an interlude before the film returns to the Soviet economy in the third and last movement, “Operation Y” itself. “Operation Y” opens at the “kolkhoz market” at which everything but agricultural products is being sold. At one of the stalls, a man sells wall paintings and the dialogue with the customer clearly mocks Khrushchev’s famous dislike of abstract paintings and his prudery. The rest of the episode is devoted to the ploy arranged by the head of the local warehouse and three local thugs. To deceive the arriving inspectorate, they organise a break in, although there is nothing valuable left to steal. 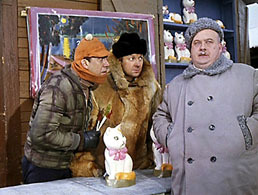 In the words of the leader of the gang, Byvalyi (“Old Hand” – or literally, the one who has been around for a long time), whose manners and looks are reminiscent of Khrushchev’s: “In our place everything is already stolen.” And so the fictitious burglary takes place at the already burglarised department store, ridiculing the structurally ingrained susceptibility of the Soviet state operated merchandising to thievery. If Khrushchev’s work on housing problems was familiar to Soviet audiences, his interest and investment in agriculture was known to be second to none. His involvement in constant changes in agricultural production included a great expansion into the “virgin lands” of Kazakhstan and Siberia during the late ’50s, construction of large agro-towns, and cooperation with and promotion of the controversial scientist Lysenko. He was also known for his war against the small private plots on which kolkhoz members actually produced a surplus that they later could sell at the market. Their abolition made food even scarcer, and the introductory scene of “Operation Y” is a clear reference to the sad state of affairs in Soviet agriculture. Constant scheming had already made Khrushchev’s collaborators tired and weary even before the dismal harvest of 1963. 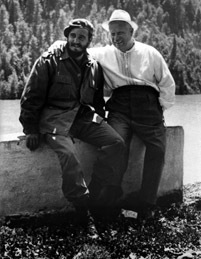 In addition, in early 1964, just a few months before his downfall, he engaged in a renewed drive against the peasants’ private plots and livestock holdings. Thus, it is easy to read “Operation Y” as the final judgment on Khrushchev’s contribution to Soviet agriculture. He left the village inefficient and plundered, with peasants engaged in everything but the production of food. The immediate announcements that followed Khrushchev’s dismissal on October 16, 1964 referred only to his age and health as reasons, without any details. The newspaper denunciation quoted above, which was published the day after, never mentioned his name. Despite this, and although he was explicitly brought up in the press on only a single occasion before he died in 1971, the claim that “his successors wished to forget that he existed, and clearly…hoped that the public would forget him as well” is belied by Gaidai’s films (13). 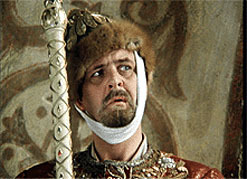 It appears that as he was pensioned off, show trials and ritual party congress attacks were replaced by a much more sophisticated weapon: derision in the very popular, seemingly innocuous Soviet comedy genre films that went into production very soon after his downfall, where the main structural tool used was the sight gag and the “knowledge effect” it produces (14). Primarily because of his immensely popular 1968 comedy Diamond Arm (Brilyantovaya ruka), Gaidai was recently even called the main dissident in the Soviet cinema during its period of stagnation. Along the same lines, one might propose that Operation Y and Other Shurik’s Adventures was an episode in his personal crusade against Soviet foibles. However, this seems highly unlikely. Firstly, two screenwriters worked on the script along with Gaidai. Furthermore, knowing the number of hurdles the script had to jump through in order to go into production in the Soviet system, the complex manner in which Khrushchev features in the comedy must have been approved, and even initiated, from a higher place (15). So, if Operation Y was primarily a vehicle to discredit Khrushchev, what are we to say about its references to the inadequate Soviet economic system? Although the economic shortcomings are clearly connected with the departed leader, they are presented as systemic, rather than solely being an outcome of his style of leadership. He did not do much to solve them, but what is the Soviet viewer in the summer of 1965 to perceive as the way out of an obviously existing problem? If the answer seems to be only hinted at, the middle of 1965 was a rare time when the question could have been openly asked. Even if Khrushchev had not been an ardent proponent of the introduction of market instruments, he had opened the space for others to begin asking the question. Operation Y and Other Shurik’s Adventures arranges a number of diegetic objects and events that relate to the extra-diegetic reality on many levels. By recognising these relations, the contemporary viewer was able to form a multifarious, abstract and reflexive working model based on a cinematic form apparently as simple as slapstick. It is obviously not a matter of a momentary hint at the social circumstances, but rather a sustained effort, with a complex outcome. Gaidai uses the figure of Shurik, a bespectacled, good-natured student (whose emotional identificatory power comes from outside this filmic text), in order to guide viewers through a more intricate mental model related to their experience of reality outside the theatre. Thus, the viewer faces a complex relationship between abstract concepts, signifiers, and material traits of the text. At the same time, the basic diegetic situational model is a source of strong and vivid emotions that freely circulate and inform the satiric layer of meaning. 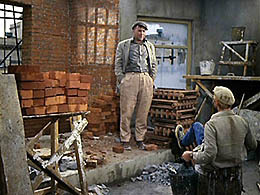 The rhetorical power of Gaidai’s narrative lays exactly in the “eureka” effect of the sight gags, and other associational forms of reasoning, while Shurik replaces the already obsolete worker or peasant from the Soviet films of previous decades, revealing the rising aspirations of the Soviet population and the change in their worldview (16). The basic problem facing filmmakers who wish to make a satire is the relationship between the diegetic world of film narration and the satirical layer of meaning. They both use the same signifying field, and they both rely on the power of recognition in human thinking. The competition of two (or two groups of) working models, one situational, diegetic, and the other satirical, more abstract, in which the individual objects do not stand for themselves, but for the classes of objects, and even more abstract constellations that involve perceptually absent social institutions and relations, means that none of them can be self-enclosed from the moment the viewer begins to form the outlines of the satirical working model. The stronger the narration insists on the relevance and continued existence of the abstract satirical model, the stronger is the possibility that the recognition of object-events will be made too stringently dependent on the inflexible, prescriptive abstract model, which claims higher explanatory competence. But slapstick in Operation Y and Other Shurik’s Adventures is utterly untamable, and it constantly keeps the process of recognition alert. On the other hand, instead of openly and early revealing the outlines of his satirical model, Gaidai gradually builds it up in close connection with the events of physical comedy, which takes place on the diegetic level. Some elements of the satirical model are more easily visible than the others: the critique of technocracy, and of socially irresponsible behavior, for example. But only after the viewer brings forward more hidden elements of its structure, can the full dimensions of the abstract model be apprehended. This is where we see the close similarity between the functioning of the sight gag in visual comedy and the moments filled with surprise here, in which the viewer suddenly realises that the function of objects in slapstick simultaneously hides and illuminates the function of the “same” objects in the abstract satirical working model. Interested forces in the Soviet political structure were obviously aware of the tremendous popularity of comedy with domestic audiences, even before the detailed survey conducted in the region of Sverdlovsk in early 1966 (17). The atmosphere of the Thaw, which began soon after Stalin’s death in conditions of a power vacuum, persisted, interspersed with periods of tightened control, throughout Khrushchev’s reign. His style of leadership seems to have been crucial for this. Never happy with what had already been achieved, dynamic, erratic, crude and rude, yet increasingly removed from Stalin’s repressive policies, he created an atmosphere with much more space for the political initiative of others. After his secret speech at the 20th Congress of CPSU and subsequent drives against the “cult of personality”, the dogma of the Party’s infallibility could never again have the same power, nor could the position of Socialist Realism in the arts remain the same. Political discourse in the arts thus became much more complex and varied. In the comedies of Gaidai we face works that obviously did not aspire to be dissident in relation to the centers of power. However, the need to influence public opinion in regard to pertinent political questions is evident. In order to explain the reading strategies available to viewers, the answer should be sought in the affinity between the filmmakers and the political agenda of various centres of power. In interpreting these films, it is most profitable to search for the line which divided the ceremonial tribute to the sacred cows of the system from genuine discursive and political innovations in given historical circumstances. However, what makes this process more complicated is that judging by the films discussed, it was obviously perceived that this line should not be consciously identified, since this would diminish the effectiveness of the agenda with wide audiences. Andrew Horton has attempted to distinguish between carnival and lashing satire in Soviet cinema and in general (18). He draws on Mikhail Bakhtin to formulate the notion of carnivalesque laughter as a “folk laughter by the people, for the people, and is, in the spirit of the carnival, a sanctioned, liberating attack on all authority.” On the other hand, “lashing” satire is described as subjecting the ills in society to a devastating critique. Consequently, carnivalesque laughter would be primarily used by the people in their struggle for autonomy from oppressive social institutions. For Bakhtin, the carnivalesque is appropriated by the novel from folk culture, but many caveats are necessary in trying to apply this concept to cinema. While the novel can still be seen as work of a writer, industrial cinema as an activity which demands significant capital for its operation must have very strong links with social institutions throughout the production process. In these conditions, it is hard to see how the state, or the social groups, which control the capital could be excluded from the very substantial involvement in deciding what kind of humour will be used. Alternatively, we could presume that certain social groups would have an interest in using a form of humour, which invokes a spontaneous, joyful satiric laughter of the people. In this case, we would have in front of us an amalgam, a satiric form not wholly immune to the manipulation by the centers of power, while it retains some of the liberating features of the carnivalesque satire. They can be found perhaps not primarily in its meaning, but rather in the general relaxation of relations based on fear, which it brings about, while in addition enabling the viewer to approach the world from mutually exclusive positions. This is a tempting proposition, which would mean that the viewer could selectively discard ideological baggage and appropriate the discourse toward liberating purposes. We would have a form of resistance reading, a notion which has been sometimes hailed as a neat solution to the problems of ideological positioning. The Gaidai films discussed here fit the category of the carnivalesque if any do, yet we have seen to what extent the discourse of ridicule can be appropriated by the centers of power and steered in a desired direction. In other words, no definite point of view can be ascribed to a stylistic form without acknowledging particularities of a discursive situation. Operation Y and Other Shurik’s Adventures constructs an alternative “situation” model for Soviet viewers, which strongly engages their working models of reality in the interpretation of the narrative. Gaidai’s comedy employs the sight gag in order to involve the figure of Khrushchev, and thus destabilise the primary diegetic network. The doubling of the figure of the engineer lends a particular potency to the semantic elements present in the basic diegetic situation model, and enables the viewer to take a more reflexive position in regard to the work, but more importantly, towards the worldview from which the specific object has been retrieved. In the long run, the rigidity of Socialist Realism as an artistic mode seems to have been incompatible with the widespread popularity of comedy of this kind. Noel Carroll, “Notes on the Sight Gag”, Andrew Horton (ed.) Comedy/Cinema/Theory, University of California Press, Berkeley and Los Angeles, 1991. Daniel Morrow, “Situation Models and Point of View”, Willie van Peer and Seymour Chatman (eds), New Perspectives on Narrative Perspective, State University of New York Press, Albany, 2001. 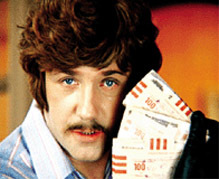 Gaidai had already thoroughly satirised “upravdom” in his classic Diamond Arm (Brilyantovaya ruka) (1968). In his play, which he wrote in 1935, Bulgakov envisaged that the roles of “upravdom” Bunsha-Koretskiy and Ivan the Terrible be played by two different actors. This was, of course, dictated by the representational potential of theatre. By using the same actor for two main roles, Gaidai significantly enhanced the expressive strength of Bulgakov’s original idea. As we have seen, this was a highly characteristic feature of the silent film comedy. For the contemporary American release, the company that released the DVD, Ruscico, used the title Ivan the Terrible: Back to the Future. The translation seems very appropriate, for it is a Back to the Future sequel made in the States during the 80s that exemplifies the main principles of assembling a series of internally incoherent situation models from elements, which, if sorted by its position in “story time” originally “belong” to different situation models. At the end of Diamond Arm Gaidai masterfully parodies Eisenstein’s style in a scene in which the main hero fights two gangsters at the car mechanic’s workshop. This is a very good example of how a brief shift in stylistic features may, if noticed, bring about a profound change in the viewer’s attitude towards the diegetic characters and events. Iskusstvo kino, no. 9, 1996. Sergeii Dobrotvorskii, “And his Task is…” (“I zadacha pri nem…”), Iskusstvo kino, no. 9, September 1996. “In a free society everything can be published and it is forgotten because it is seen at a glance. Under absolutism everything is hidden, but may be divined; that is what makes it interesting.” Michael Tatu, Power in the Kremlin, Viking Press, New York, 1969, p. 5. Although the differences between free society and absolutism may not be as sharp as implied here, this statement by the Marquis de Custine from 1839 suggests a possible rationale for trying to offer an interpretation of a popular comedy made some 40 years ago. Khrushchev and his agricultural policies were also roundly criticised at the March 1965 Central Committee Plenum, although again he was not personally named. In Communist countries in general a favourite way to publicly prove the successes of Communism was to officially compare the 1913 (or 1939) statistics with those of the current year. A quantitative claim was sufficient proof to support the argument (which was always the same, that “we” are much better off materially now than under the old regime). William J. Tompson, Khrushchev: A Political Life, St. Martin’s Press, New York, 1995, p. 277. In Diamond Arm Gaidai continues to ridicule Khrushchev and his rule. However implausible it may sound, it seems that the fishing scene was inspired by the stories of Khrushchev’s guests being guaranteed good fishing luck with the help of adequately placed divers. Soviet cinema has from its early years referred to important political figures. In Stalin’s time his cult was pervasive in the movies made in the Soviet Union. See Hans Günther, “Wise Father Stalin and His Family in Soviet Cinema,” Socialist Realism Without Shores, Thomas Lahusen and Evgeny Dobrenko (eds), Duke University Press, Durham, 1997. This was also a prominent feature of Montage films, especially those made by Eisenstein, which frequently brought in Lenin to support the validity of their arguments. Even in Battleship Potemkin (1925), which takes place in 1905, a leader of the rebellion Vakulinchuk, who, we are told, “was first to fire a shot,” and among the first to die, after being mortally wounded hovers above the water, which has already become a grave to the officers thrown overboard, just as Lenin, the leader of the revolution, hovered between life and death after his assassination in 1921, until he finally died in 1924. (Equally tellingly, Vakulinchuk in the film looks more like Stalin than like Lenin, although the contest for first place in the Soviet leadership was only just heating up at the time.) The sailors attempt in vain to save him and by the time he is brought up from the sea, he is already dead. Nevertheless, he remains the beacon in the continuing revolutionary struggle, whom thousands of soldiers and grieving citizens pay last respects while he lay in waiting (just as they did to Lenin in 1924). Josephine Woll, Real Images: Soviet Cinema and the Thaw, I.B. Tauris, London, 2000, p. 188. Andrew Horton, “Introduction: Carnival versus Lashing Laughter in Soviet Cinema”, Horton (ed), Inside Soviet Film Satire, Cambridge University Press, Cambridge, 1993.